Do people believe what they see or do they see what they believe? Climate change deniers, for example, will ignore overwhelming evidence that the Earth’s temperature is rising. They will look for the smallest piece to support their own beliefs. If a snowstorm occurs, they will say: “See, it is cold. The Earth is not warming.” They refuse to see that climate chaos – such as extreme weather – is a symptom of the overall system responding to climate change. 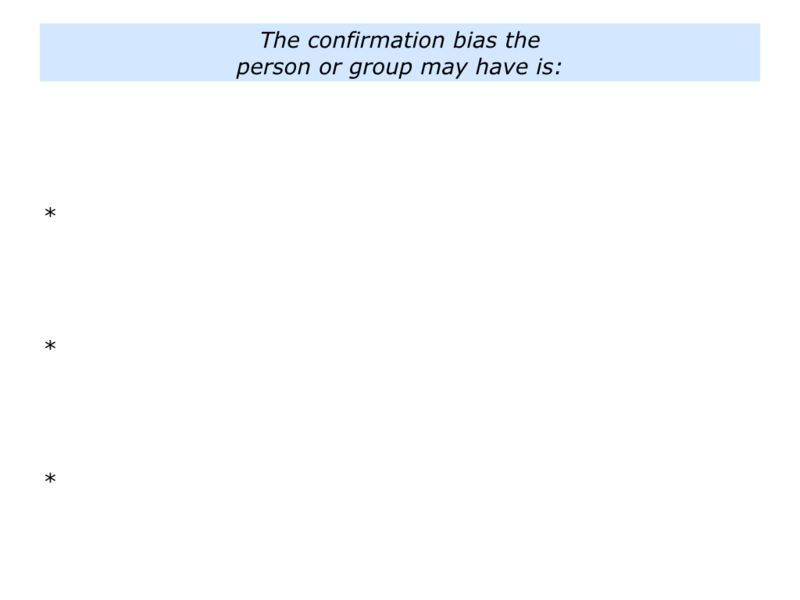 Everybody has some kind of confirmation bias, certainly I do. During my teenage years I looked at the negative things in life. Several years later I had a Road To Damascus experience. The specific times that people have performed brilliantly in the past. The specific things that people did right then – the principles they followed – to perform brilliantly. The specific things people can do to follow these principles – plus add other skills – to perform brilliantly in the future. Looking at my own confirmation bias, this approach has consequences. These include both pluses and minuses. The pluses are that it is encouraging to study success. It also provides positive models and practical tools that can be passed on to people to help them to succeed. The minuses are that I may overlook people’s negative patterns and the potential consequences. 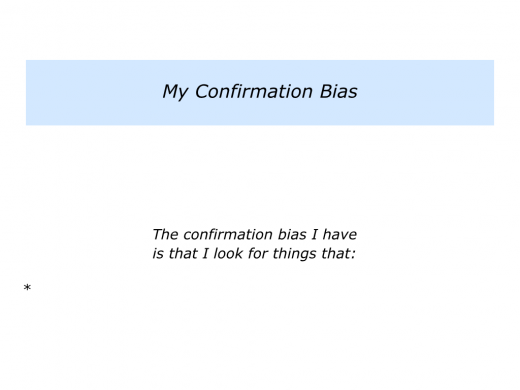 Looking at your own life and work, do you have a confirmation bias? If so, what is it? How do you demonstrate this in practice? 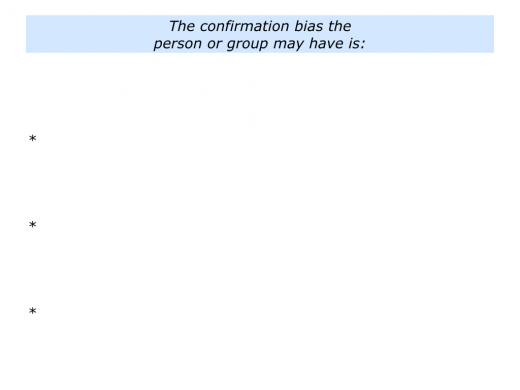 What are the consequences of the bias? 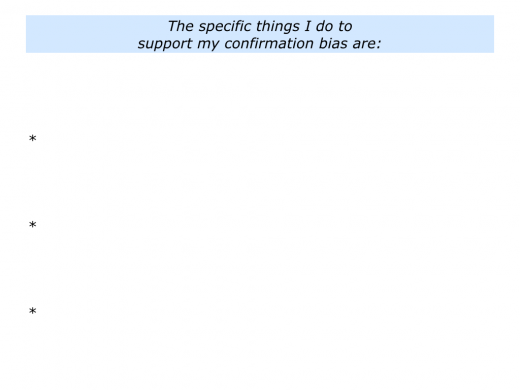 Describe the specific things that you may do to support your confirmation bias. 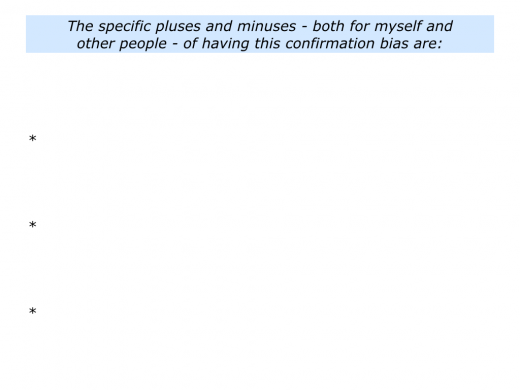 Describe the specific pluses and minuses – both for yourself and other people – that may result from your confirmation bias. 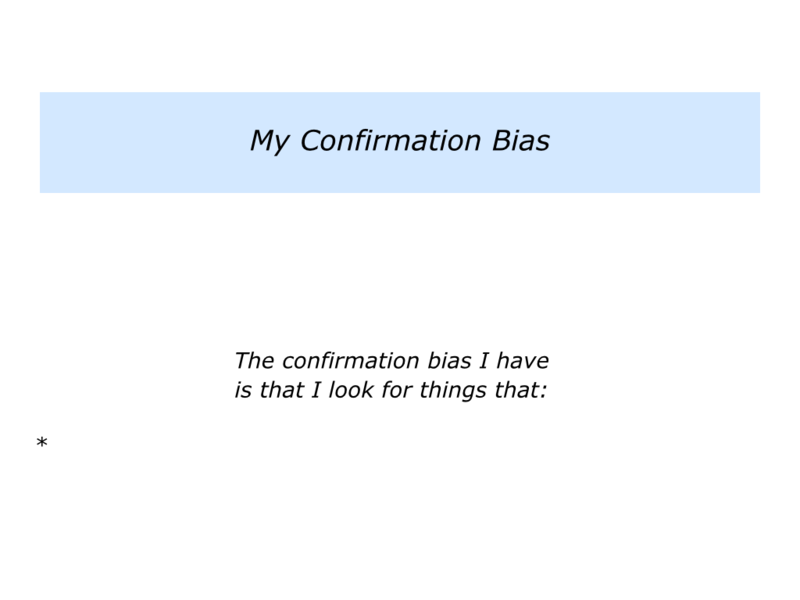 Sometimes you may come across confirmation bias in your work. Imagine that you work as a facilitator, mentor or coach. On some occasions you may be invited to help influential people to make decisions. Such people may have a strong confirmation bias. Bearing this in mind, how can you help them to recognise reality and make good decisions? One approach is to help people to work through the stages of clarity, creativity and concrete results. To clarify all the possible choices going forward – including the ones they would normally dismiss – and the consequences. To clarify the option – or combination of options – they want to pursue which is most likely to deliver the real results they want to achieve. 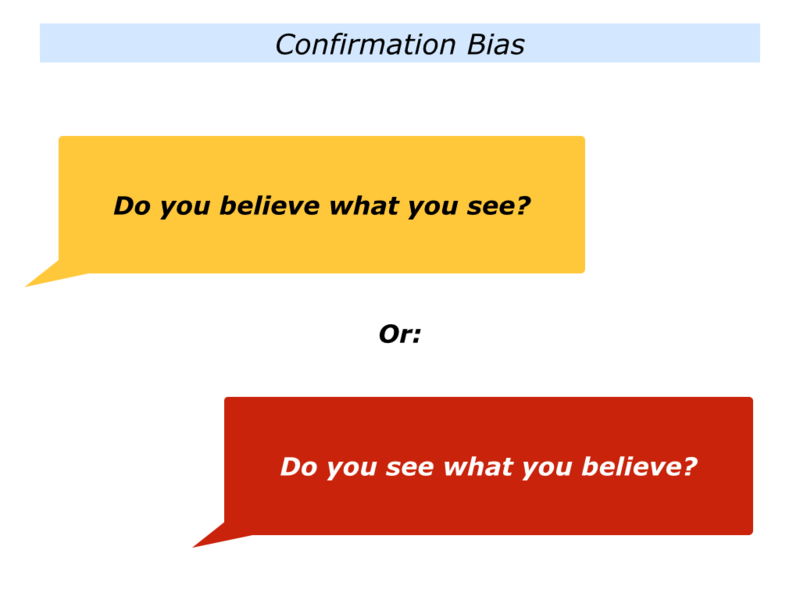 This sounds easy in theory, but it carries the risk of people falling into confirmation bias. They may ignore or dismiss any possible options that fall outside their preferred way of thinking. How to tackle this challenge? One approach is to help people to focus on consequences. 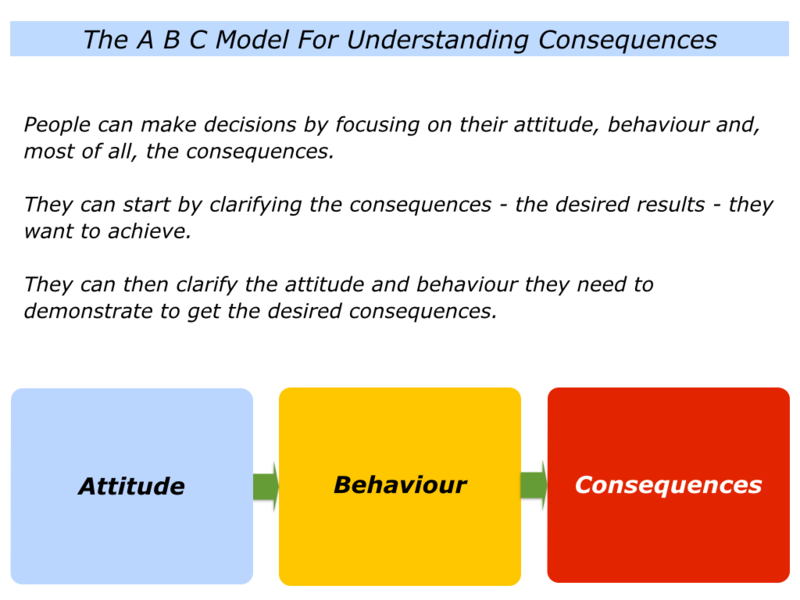 You can do this by using the ABC model for looking at Attitude, Behaviour and Consequences. This was an approach I used when working with young people in therapy. The key was to focus on the consequences – the desired results – they wanted to achieve. People often defend their attitude and behaviour. They describe the feelings they have and the reasons why their behaviour is justifiable in the circumstances. 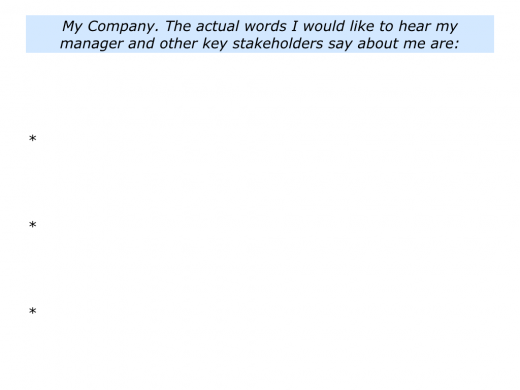 Pressing them on these issues on leads to them confirming why they believe they are right. The approach we took in therapy was to start with the consequences. What were the results they wanted to achieve? Did they want to live healthier lives? Or did they want to stay in trouble? If a person wanted different consequences, then they may need to demonstrate a different attitude and behaviour. It was their choice. This led to some young people being prepared to look at other options. Confirmation bias is strongly linked to a person’s belief system. This influences how they relate to other people. They look for evidence that justifies their view of people and the world. Sometimes this can harm people’s careers. 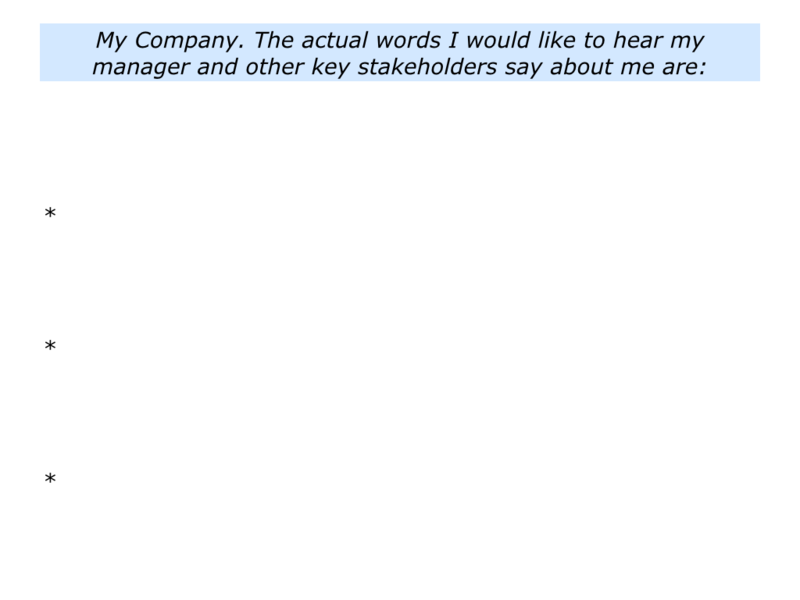 Over the years I have sometimes been asked to work with leaders who have been given the following message. “You are very bright, but you lack people skills. People see you as, at best, intimidating. Some see you as a bully. 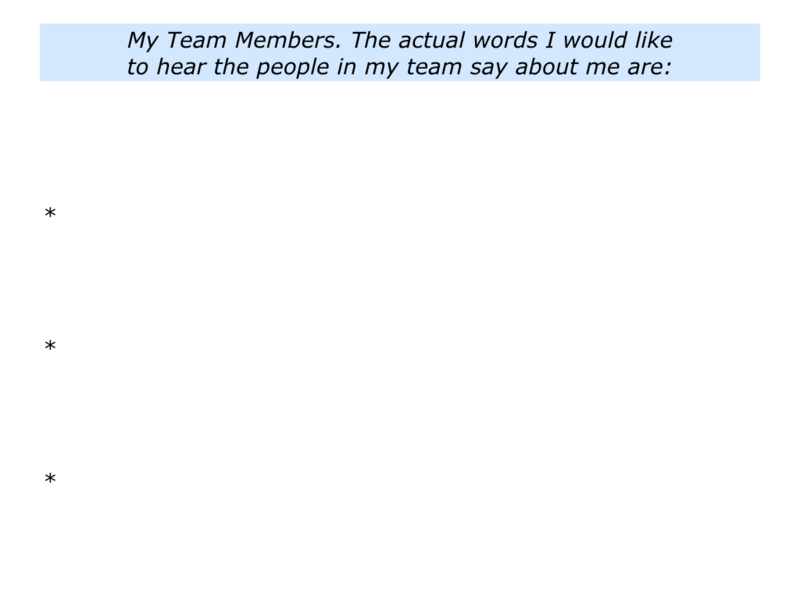 One leader who got this message asked for help. His leadership style was to ‘be the smartest person in the room.’ Sometimes he tried to make himself look big by making others look small. He also micro managed people and kept pointing out their mistakes. Why? He believed this was the way to help people to grow. Initially he quickly rose through the ranks, but then he twice got passed over for promotion. The reason? People did not like being bullied. For a long time he had justified his behaviour by referring to the poor quality of staff. But then he found that good people started leaving. Meeting him offsite, the first job was to establish if he really wanted to try a different approach. The leader said he was serious. He was also experiencing difficulties at home, where his daughter was distancing herself from him. The old style approach would have been to start by looking at his attitude and behaviour. Using the ABC model, however, we began by focusing on the desired consequences. What were the results he wanted to achieve? The leader did an exercise that invited him to start from the destination and work backwards. 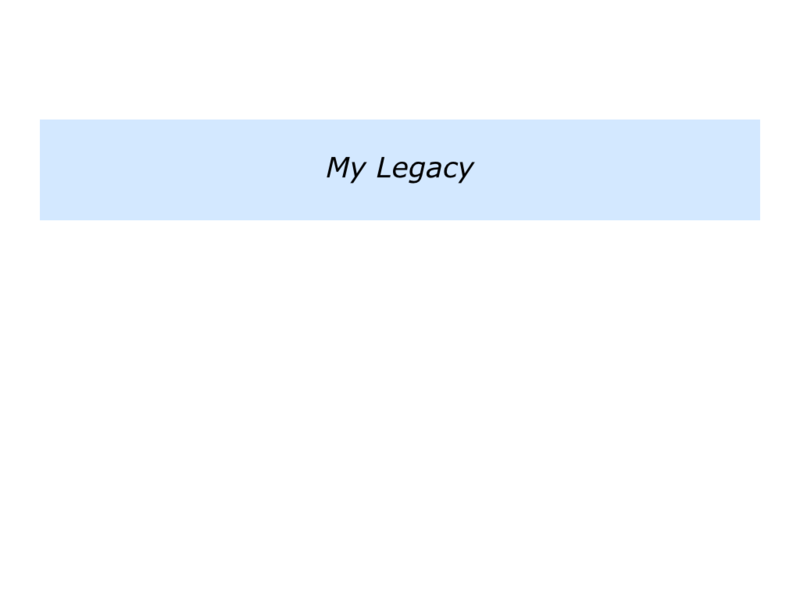 We focused on his legacy. What were the actual words he wanted people to say about him? He did the following exercise. The leader then explored the specific things he could do to achieve these results. These actions had implications for his attitude and behaviour. 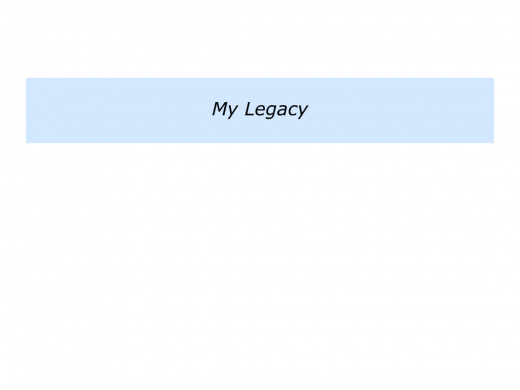 He saw the point of making these changes, however, if he wanted to achieve the desired legacy. 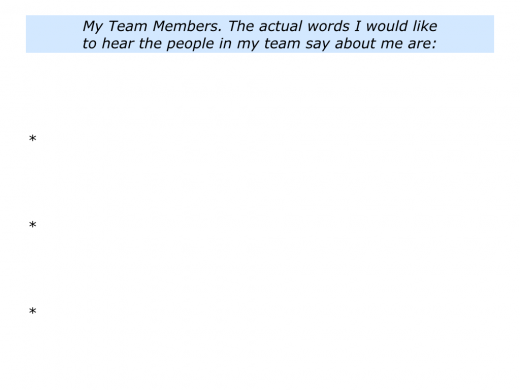 The leader applied the ideas and, despite a few lapses, began to get better feedback from people in the company. The consequences approach worked with him, but it doesn’t with everybody. Some people choose to stick with their belief system and seek evidence that justifies their confirmation bias. Looking into the future, can you imagine a situation where you may be asked to help a person or a group of people to make decisions? 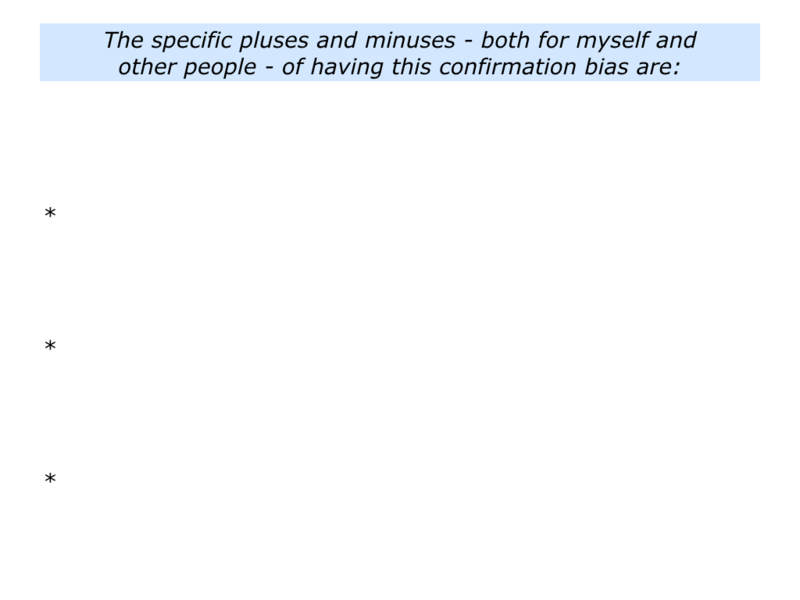 Such people may have a strong confirmation bias that influences their view of the world. 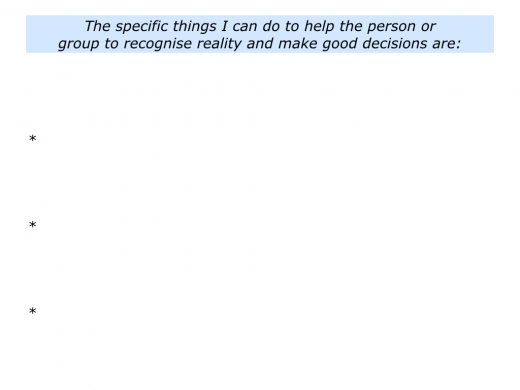 How could you help them to recognise reality and make good decisions? 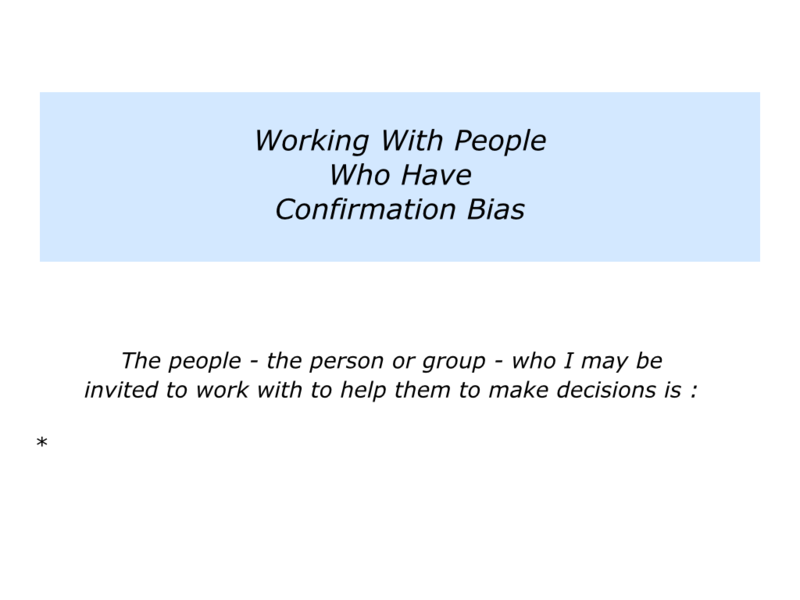 Describe a specific situation when you may be invited to work with people – a person or group – to help them to make decisions. 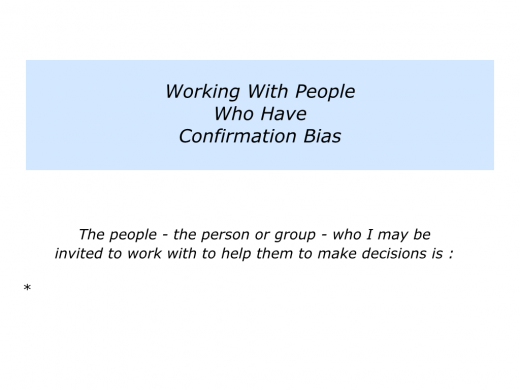 Describe the confirmation bias that the person or group may have. 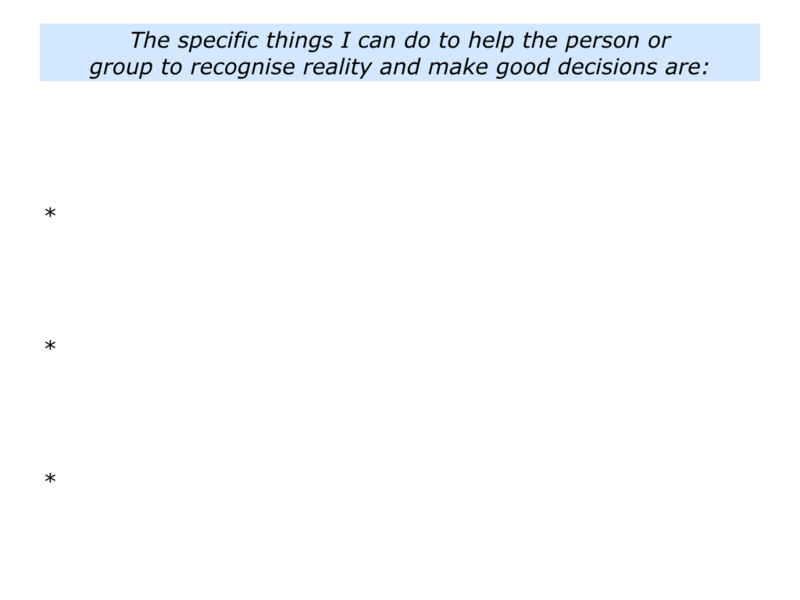 Describe the specific things you can do to help them to recognise reality and make good decisions.